The Social Development Minister again fails to answer questions about her role in the Sassa fiasco. It was another day of Social Development Minister Bathabile Dlamini evading questions during an inquiry into her role in the South African Social Security Agency (Sassa) crisis, shifting the blame for it and starkly contradicting her version of events under oath. The inquiry – which has been mandated by the Constitutional Court to determine whether Dlamini should be personally held liable for the Sassa crisis that jeopardised the livelihoods of 17 million social grant beneficiaries – has seen her say little under cross-examination. And the second day of the Judge Bernard Ngoepe-led inquiry was no different. So far, Sassa’s controversial work streams – a parallel function that was established in July 2016 and comprised of Dlamini’s handpicked advisors to investigate Sassa’s capacity to take over social grant payments from incumbent Cash Paymaster Services (CPS) – have dominated the inquiry. The work streams, which were cancelled in July 2017, were controversial because officials from Sassa had little knowledge of their existence, they failed to deliver and cost the taxpayer more than R30 million, which National Treasury deemed irregular expenditure. Two Sassa insiders recently told Moneyweb that the work streams, which were led by Dlamini’s pal Zodwa Mvulane, were pushing to extend CPS’ contract for two years despite the Constitutional Court declaring it invalid in 2015. When questioned by Geoff Budlender, the senior counsel for civil rights group Black Sash, on why the work streams reported directly to Dlamini while bypassing the Sassa executive committee, Dlamini dodged the question. Budlender SC: The work streams were unlawful because it’s a Sassa operational matter and you have no power as minister to run a Sassa operational process. Would you comment? Dlamini: As a political head, I have to know what is happening. Now I’m told that I have to look at certain things and turn a blind eye to others. Budlender: Do you have operational control of Sassa? Dlamini: What is operational control? Where would I run Sassa? Budlender: Do you have the power to run Sassa? Dlamini: I’ve never run Sassa. Budlender: And do you agree that you don’t have the power to run Sassa? Dlamini: I did not run Sassa from start to finish? Budlender: Do you agree that you don’t have the power to run Sassa? Dlamini: I don’t understand the purpose of the question. Budlender asked the same question for the fourth time. Dlamini: I don’t understand the question. She also evaded answering the question six times about whether every decision made by the Sassa executive committee requires her concurrence. She bizarrely added that in the history of the Department of Social Development, the Sassa CEO and minister never locked horns over the agency’s operational matters. She was referring to former acting Sassa CEO Thokozani Magwaza, who was abruptly fired in July 2017 by Dlamini for cancelling the work streams and beginning discussions with the SA Post Office to take over social grant payments from CPS. 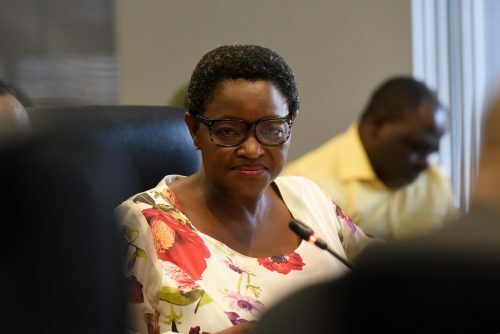 Dlamini contradicted herself as on Monday, telling the inquiry that no one ever raised concerns about the controversial nature of the work streams. However, on Tuesday she admitted to receiving a letter from Magwaza in which he raised concerns about the governance structures and many Sassa officials being excluded from the work streams. Dlamini refused to clarify her contractions, only saying she wanted to see Magwaza’s letter that was used as evidence in the inquiry. She said the work streams started long after Magwaza was appointed as Sassa acting CEO in 2016 and any “hiccups” with the work streams “happened after Magwaza took the job as acting CEO”. Budlender saw this as Dlamini attempting to shift the blame for the Sassa crisis. Counsel for Magwaza and former Social Development Director-General Zane Dangor, who both cited a breakdown in their relationship with Dlamini, will cross-examine Dlamini at the inquiry on her testimony. Dangor resigned from the department in March 2017. In another effort to shift blame, Dlamini said that for six months, none of the Sassa officials told her that the agency would not meet its deadline to phase out CPS’ contract and take over social grant payments by April 1 2017. This is despite Sassa knowing since April 17 2016, that it wouldn’t be able to take over social grants as contained in a letter sent to it by the state attorney’s office. Dlamini said she only heard that Sassa would not be able to take over social grants in October 2016. Dlamini was repeatedly asked why she didn’t ask Mvulane, the work streams and Sassa leader, for regular updates on the takeover process. Again, Dlamini was refused to answer questions directly pertaining to Mvulane. The inquiry continues on Wednesday.